Last summer I wrote a shooting profile of Chris Webber at Nylon Calculus and later posted some of his passing stats here. During all-star weekend, I added to the latter but never updated the post. With the Lowe Post podcasts featuring Howard Beck and Shane Battier mentioning Webber and those early-2000s Kings, now would be good to, like, post those updated numbers instead of letting them sit in a folder. I also spent some free time adding a few more games, random thoughts, and GIFs. Webber’s best years are very good GIF material. Like 90 percent of the regular season games I watched weren’t in English, but that’s okay. There were a couple YouTube accounts with a TON of sports games from overseas and just so happened to have random Kings-Wizards, Kings-Clippers games. Maybe Sacramento really did have worldwide appeal? 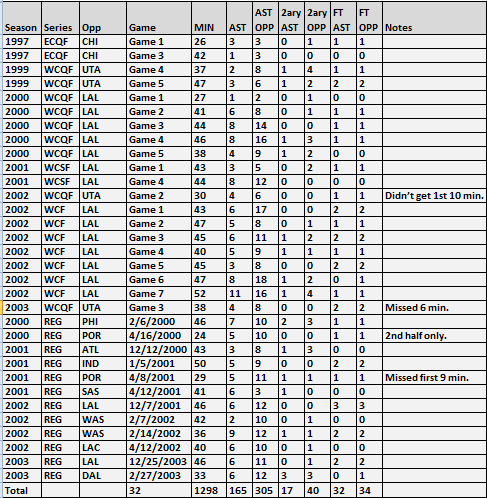 This is still a small sample of games, less than 10 percent of Webber’s from 1999 to 2003 (added two 1997 games anyway). It would be nice to get more regular season totals, and maybe that’ll happen with how many random games pop up over each off-season. The hockey assists are a little underwhelming, in my opinion, but as a team I feel like there’s no doubt the Kings would’ve crushed in this stat. Same with the late-90s Sonics teams, among others. I may have been too picky on free throw assists, but I don’t remember if at first I gave them only to shooting fouls. If that’s what I was doing, Webber’s real free throw assist totals would get a nice boost considering how often he would use his behind-the-back pass to find a cutter near the rim. Those passes definitely did not always work, by the way, but the payoff in the long run was greater than the occasional turnover. How exactly do you guard those, the normal passing angles and Webber’s scoring? There were so many handoffs around the elbow to post-Magic Nick Anderson, one of a few players from 1999 to 2001 who I think are easy to forget. Maybe there wouldn’t be much of an assist difference since overall there isn’t much of one, but Anderson getting those handoffs around the arc instead of an older Peja Stojakovic, Hedo Turkoglu, or Mike Bibby…I don’t know. I should’ve tracked the assist opportunity field goal percentage on strickly jumpers. Once Webber became a ~50 percent shooter from the elbows, those handoffs seemed like a low-key nightmare to guard. He was, um, clever enough to fake them for shots and attack cheating defenders off the dribble, but a reliable jumper was another effective option as a safety valve for whoever was running off him. For all the offense involved, the few Mavericks-Kings games I watched with or without Webber were a lot more physical and intense (Mavs fans and THEIR cowbells!) than I expected. Nothing like seeing these two play in the second round. The damn West. For somebody of Webber’s value, he committed some really, really bad fouls. He also got away with some, such as a reach on Robert Horry in the final minutes of Game 6 in 2002. If that was called? Yikes. I love Webber’s offense and will defend his efficiency, but I also might be too harsh on his defense and rebounding. It’s kind of jarring how different Webber was after his knee injury. Did this stage of his career really happen? His stint with Philadelphia in 2005, given his minutes per game, is probably one of 100 worst >500-minute stints/seasons in league history. What other modern day guys would make the cut? 2004 Antoine Walker and 2013 Kevin Love? So much Sasha Pavlovic, too. These random thoughts are getting really mean. One of several fascinating statistics over Webber’s career: 2005-06 season, he was 32 years old and two years after knee surgery, but played 75 games and nearly 39 minutes per for his career high in season minutes. Okay that’s it, enjoy some GIFs! Some may be potatoes, though. Also, if you’re on a phone, beware: They’re on auto-play, and probably load slow at first because of that. I thought that was a low-key amazing pass. That was a really fantastic quarter. That might’ve been what made Webber unlikeable. 17-point lead with ~16 minutes to go and doing a little showboating, but these two teams played a pretty physical game a week prior and that was Webber’s former team. REVENGE OR SOMETHING. That was literally the first possession of the game. Fun times. Now, time to get all set for the 2015-16 season. Hope you all are, too.